IS THE universe telling us something? 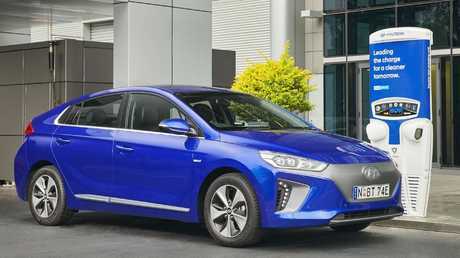 The latest addition to the garage, Hyundai's planet-friendly, zero-emissions Ioniq, has had a baptism of fire courtesy of Australia's increasingly unpredictable weather. Australia's cheapest electric car was first battered by a freak hailstorm, then made to sweat on Christmas Day with a trip to the relatives in stifling heat and infuriatingly slow traffic. Weather extremes tend to sap the range of EVs and this was confirmed as soon as the key was turned and the aircon was cranked up to fullbore. The Ioniq's official "real world" range is 230km but ours dipped to 190km by the time the family eventually piled in the back. 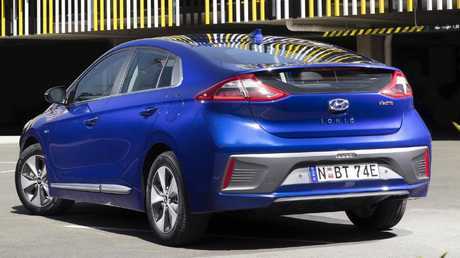 The Hyundai Ioniq has a much shorter range than a petrol car. From the driver's seat, a couple of things strike you immediately. In lieu of a traditional knob to shift the car into drive, there are three buttons - drive, park and reverse. It takes a bit of getting used to but it's simple to operate and clears more space in the centre console. So too does the lack of a transmission tunnel, which frees up room for handy storage in between the driver and front passenger. The wireless phone charger is a neat hi-tech touch as well. With drive selected and the Ioniq fully loaded with five people and presents, we took off smoothly, silently and with a satisfying amount of oomph. The airconditioning drew initial complaints from the back seat, but up front driver and passenger had found the seat cooling function and couldn't work out what the fuss was about. The aircon did struggle a little getting the whole cabin cool, though, despite the rear air vents. We had to turn it to full blast for a while before everybody was happy. 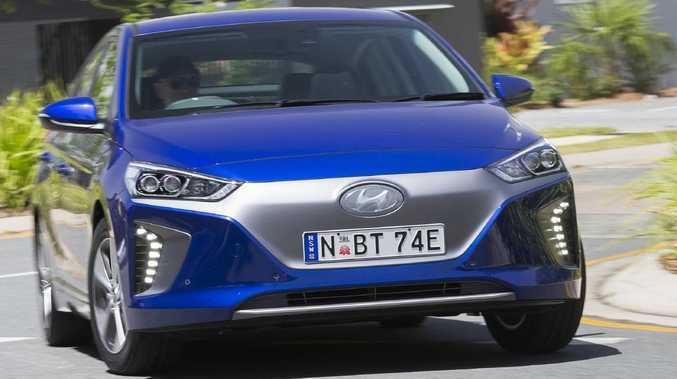 The Ioniq feels just like a normal car to drive. Once on the road you are struck by just how normal the Ioniq feels. Some hybrids and EVs have a wooden feel to the brake pedal but the Ioniq's feels more natural and progressive. Not that you need to use it very often in stop-start traffic as the regenerative engine braking function will slow the car down when you lift off the accelerator. For the EV uninitiated, regenerative braking uses the electric motor rather than the brake pads and discs to slow the car when you lift off the accelerator. 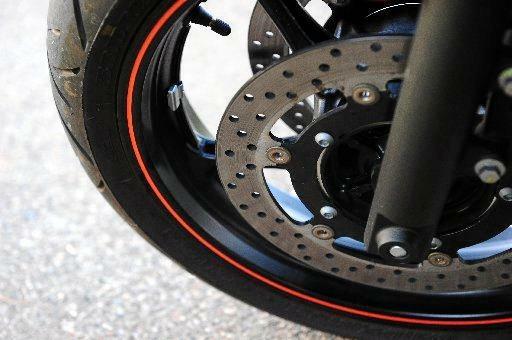 It works the same as picking a lower gear in a conventional car. The motor switches into generator mode and feeds charge back into the battery. Electric cars benefit from increased cabin space thanks to the removal of several mechanical elements. 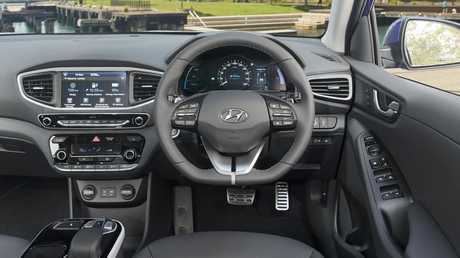 Steering, cornering and ride comfort are all typical Hyundai, which is a good thing. The car soaks up bumps well and while it's no sports car, it feels comfortable and composed through the bends. As for the range, it was showing 165km halfway after only 15 kilometres, but by the time we'd completed our return journey of roughly 55km, we still had 145km range. Not bad with devices charging, stereo blaring and aircon pumping.